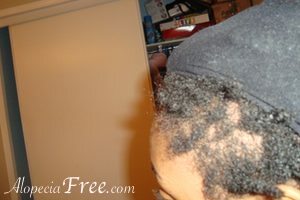 Over 4 years ago I was struggled with alopecia and hair loss. When I found out I was losing my hair, it was very sudden and very traumatic. 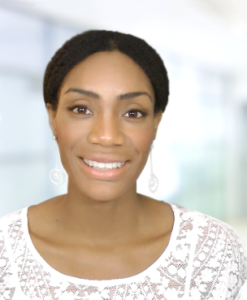 I was trying to grow my natural hair and it proved to be very difficult. It seemed to be growing very slowly and not very strong. This was a very difficult time for me and added to my insecurity. We can blame it on the media or society but the reality is, as women a lot of our identity is wrapped up in our beauty. Our hair is a large part of that beauty. My hair used to be thick. It was not very long, but it had some good density. The first time I knew I was suffering from hair loss was when my hair started to feel and look thinner. My hair loss started on the left, front side of my scalp and then eventually moved to the left, back side of my head. I decided to shave off all of my hair because it was too depressing for me to see less and less hair each day. My hair was looking really stringy and unhealthy and couldn’t take it. In this picture (above) even though the rest of my hair was growing back and filling in. 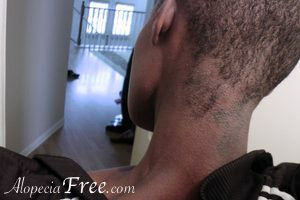 The area with the alopecia bald spot is still baby, smooth and there is no hair growth at all. 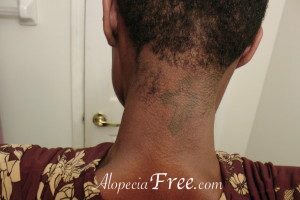 I had discovered that my hair was thinning, I had no idea that it was alopecia. All I knew was that my hair was thinning and I thought maybe I could find some support from other women online. I was looking for people who I could relate with about my hair loss. 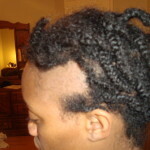 I searched the web for women who had suffered from hair loss but I kept finding women who had amazing hair growth. Not very many women openly discussed their hair loss issues. I started to realize that hair loss amongst women was rarely discussed online and that hair loss was not a large topic for discussion. The stories online that I did find were heartbreaking and made me very depressed. Many said that their hair loss spread all over their scalp and even their body. Others said their hair did not grow back at all. Many times I saw women who had been growing their natural hair for years. They had the “perfect head of hair” in their eyes, but then they soon discovered they had alopecia. These women who discovered they had alopecia had no answers as to why this was happening. Worse yet, they had no I clue what they were going to do to stop it. Watching these women made me feel like there was no end to my misery. It was nice to know that I wasn’t alone, but it was very discouraging to know that no one had any real success stories. After years of trial and error and more hair loss, I hit rock bottom. I was sick of looking in the mirror and seeing more and more hair missing from head. I needed answers and a solution that would help me to get back the hair that I had lost and with that, my self-confidence. 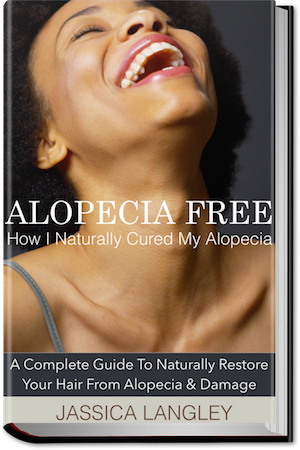 I did some research, I did some praying and I came up with a cure to my hair loss and alopecia disease. I can thankfully say that I have been Alopecia Free for over 2 years! In my book share the details of my story with you in hopes you that you find some answers, support and freedom.